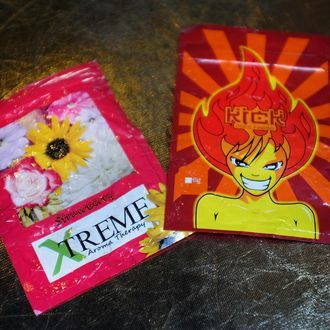 The dirt-cheap synthetic drug K2 is the dollar slice of the get-high market, often sold in bright packaging under names like spice, spike, Bombay blue, blaze, zuh, bliss, and incense. The chemical-sprayed herbs — which offer users an extra-intense, sometimes crazy-making version of a THC-like high (remember this naked guy on K2 back in August in Brooklyn?) — is now officially illegal in the city. The drug is already illegal to possess or manufacture in New York State, but thanks to the ever-changing combinations of chemicals, often combined on the fly, it has proven difficult to prosecute. The newly signed legislation is broader and prohibits drugs that “market” themselves as synthetic marijuana or any similar type. City Council speaker Melissa Mark-Viverito introduced the legislation last week. It was unanimously approved by the body. Ironically, the rise of fake marijuana comes at a time when the city has been decriminalizing possession of the natural stuff. Possession of nine packets or more of the drug will be considered as intent to sell, punishable as a misdemeanor with up to a year in jail and a $5,000 fine. Bodegas found selling the drug may have their cigarette licenses, a lucrative source of income, revoked or suspended. The law is set to be enacted 60 days from now as part of the city’s tenacious crackdown on K2. Easily obtainable at bodegas, the packets offer users — who are often homeless, according to a New York Times story — a cheap high, for as little as a buck. The Times notes that the drug has dominated areas of East Harlem, referred to as “K2 nation.” But Mayor de Blasio insists the new law is aimed at those who produce and peddle, not the indigent and mentally unstable — its customer base. “These laws do not punish the individuals that are held hostage and held in the grip of this toxic drug,” de Blasio said during Tuesday’s bill signing. “It focuses on criminalizing the process that brings this poison into people’s hands,” he added. The drug has sent some 4,500 NYC residents to emergency rooms this year alone. Users commonly report effects of agitation, rapid heartbeat, lethargy, nausea, vomiting, confusion, headaches, and seizures. At the height of this summer’s epidemic in July, 1,200 K2-related emergency-room visits were recorded. A public-awareness campaign by the City’s Department of Health aims to educate residents about the “unpredictable and serious” qualities of K2. In early September, the NYPD performed a series of high-level raids on a ten-man drug ring in Queens. The crew was producing roughly $17.5 million–worth of the synthetic cannabinoid, or nearly 150,000 packets. In partnership with the DEA, the city also seized “two tractor trailers worth” from processing plants and raided more than 90 bodegas selling the drug as part of a citywide crackdown on the drug.